Yes, the title is a play on words, and given the great threat posed to the unexplored natural environments of these two little unique islands by future oil revenues, I suppose a more appropriate title would be “Matters of Urgency,” but I couldn’t help myself. In this posting I want to talk about the work of Dr. Richard Mooi, who was with us on GG II. 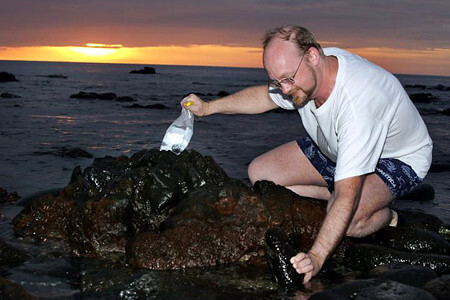 Rich stalks an unsuspecting sea urchin on São Tomé. D. Lin phot. GG II. Dr.Rich Mooi is a Curator in our Department of Invertebrate Zoology, but more importantly to us (and to the blog title! 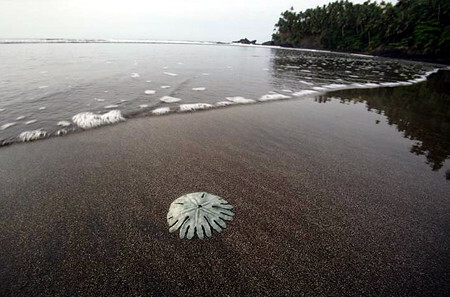 ), he is one of the world’s authorities on echinoderms, a large phylum that includes sea urchins, seas stars and what we Americans call “sand dollars,” the flat, disk-like tests (endoskeletons) of which we find commonly on our beaches. 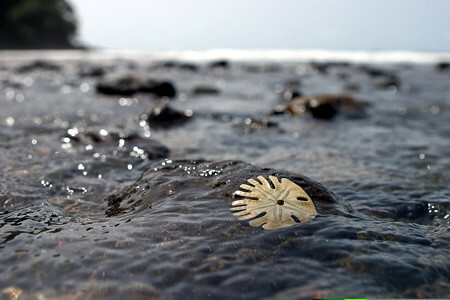 One of the most fascinating, yet poorest known sand dollars in the world is Rotula deciesdigitata, known only from the Gulf of Guinea. This species is probably not really rare but the places it occurs are remote and not frequently visited by scientists. Hence, they are super-scarce in the world’s natural history collections; even more so in North America. 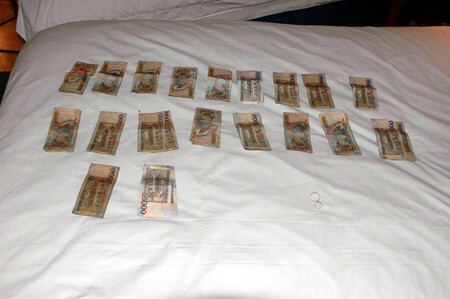 The unit of currency in the Republic of São Tomé and Prìncipe is the Dobra; there are about 15,000 of ‘em to the US dollar. Here is a photo of a bunch of dobras drying on my bed at Bom Bom Island on Principe. Why? 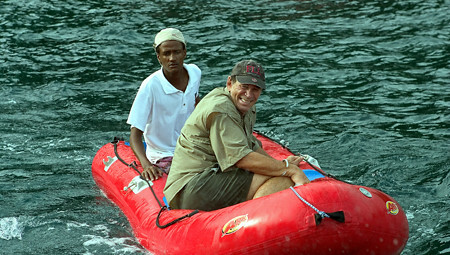 Well, the wonderful folks at Bombom Island and SCD allowed us to attempt to survey by boat the otherwise inaccessible southwest shore of Prìncipe; at a critical point, too many of us climbed into a small red dinghy and flipped in the surf. Along with the dobras went a lot of equipment including cameras, my cell phone, ipod, etc.—more on this in another posting. Anyway, once we finally found specimens of Rich’s Rotula, it was only natural that they become “sand dobras,” and the only beach we have found them on the west side of Sao Tome became Sand Dobra Beach– its real name is Praia Morrão. Rich working. D. Lin phot. GG II. Interestingly, there are many species with holes and notches in them throughout the Caribbean. These are almost all members of a sand dollar family known as the Mellitidae. However, there are absolutely no mellitids on the west coast of Africa. In fact, there are no “true” sand dollars at all. The truth is that the Gulf of Guinea sand dobras are not even closely related to the Caribbean sand dollars, but belong not only to a different family (Rotulidae), but to a completely different major clade (suborder). This is perplexing. 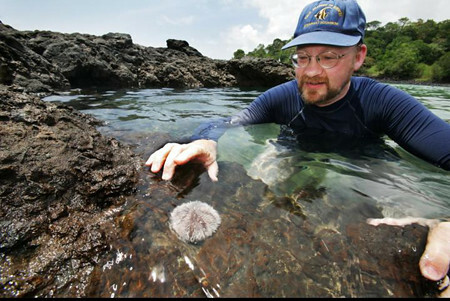 Dr. Rich Mooi is still working on the many fascinating echinoderms he collected on the beaches and tidepools of São Tomé and Prìncipe in 2006, and I will report his discoveries as they appear.